The AX6613 is a 1A ultra low dropout linear regulator. This product is specifically designed to provide well supply voltage for front-side-bus termination on motherboards and NB applications. The IC needs two supply voltages, a control voltage for the circuitry and a main supply voltage for power conversion, to reduce power dissipation and provide extremely low dropout. The AX6613 integrates many functions. A Power-On-Reset (POR) circuit monitors both supply voltages to prevent wrong operations. A thermal shutdown and current limit functions protect the device against thermal and current over-loads. A POK indicates the output status with time delay which is set internally. It can control other converter for power sequence. The AX6613 can be enabled by other power system. Pulling and holding the EN pin below 0.3V shuts off the output. 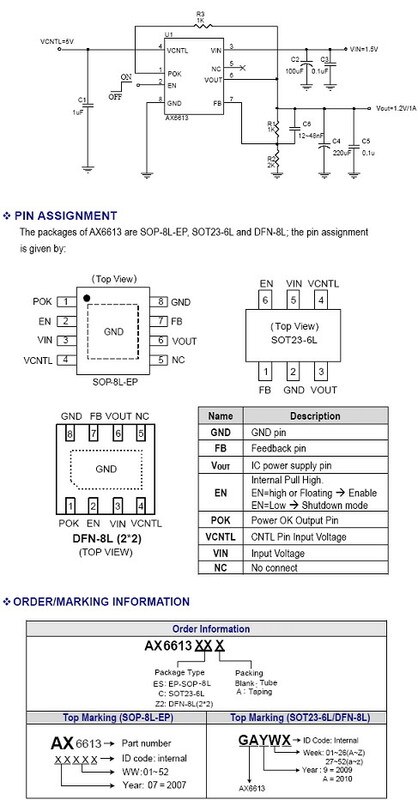 The AX6613 is available in SOP-8L-EP, SOT23-6L and TDFN-8L packages. That features small size as SOP-8 with an Exposed Pad to reduce the junction-to-case resistance, being applicable in 2~3W applications. - SOP-8 with Exposed Pad, SOT23-6L and TDFN-8L Pb-Free Packages.